The performance of your WordPress sites has and always will remain one of the top priorities for us. Because of that, we have partnered up with KeyCDN, an HTTP/2 and IPv6-enabled content delivery network with 35 locations, to turbocharge your assets and media around the globe. In our experience, a CDN typically can help offload 70% of bandwidth requests from your web host and in some cases reduce load times by up to 50%! 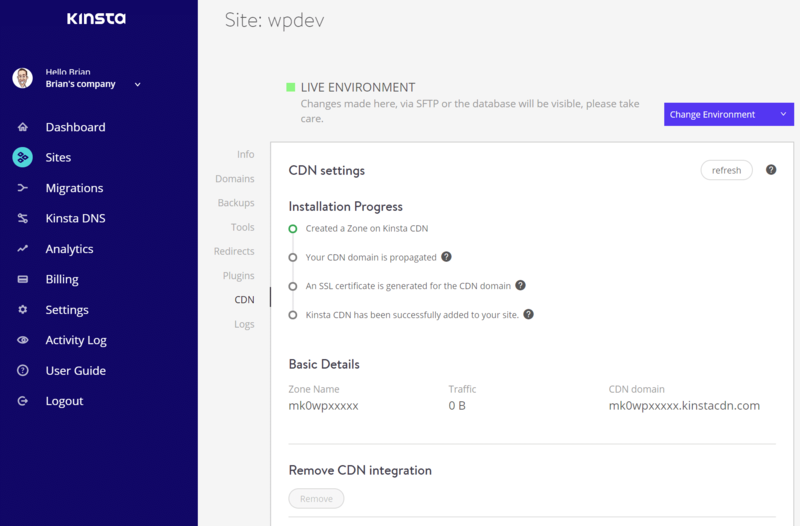 Follow the steps below on how to enable the Kinsta CDN on your WordPress site. Important: CDN integration is tied directly to your site’s domain. For this reason, if you expect to make changes to your site’s domain in the near future, you should wait to enable the CDN until after you’ve made these changes. Once the CDN has been enabled, if you change your site’s domain in any way, such as switching to a new domain or migrating from HTTP to HTTPS, you will need to select the option to Remove CDN integration. Once the CDN integration has been completely removed you can add it back. Login to your MyKinsta dashboard and click on “Sites.” Then click on “Manage” next to the WordPress site on which you want to enable the Kinsta CDN. Click on the “CDN” tab and then on “Add Zone.” This will deploy a CDN cache zone for your site. This can take up to 15 minutes. A random CDN domain will be assigned to your site and will look something like this: abcd1234.kinstacdn.com. Note: We are also working on adding the ability to use a custom CDN URL on your site, such as cdn.yourdomain.com. Purge Zone: This will clear the cache of your CDN zone. After the CDN has been deployed, you can test it with a website speed test tool. You will then see your assets and media loading from your CDN URL. Make sure when you are speed testing your CDN that you run it a couple times so that the media is cached. The x-cache HTTP header will show a “HIT” once it is cached. If it isn’t cached it will show a “MISS.” If you don’t do this properly it might appear as though the CDN isn’t helping speed up your site, when really you simply didn’t build up the cache first. Read more about how a CDN works. Each asset loaded from the CDN will also have an x-edge-location HTTP header with its corresponding location abbreviation. This way you can determine which POP and or location your asset is loading from. For example, below we can see that the location is ussf which means the asset is loading from San Francisco, USA. Below is a full chart of POPs and their location abbreviations for reference. 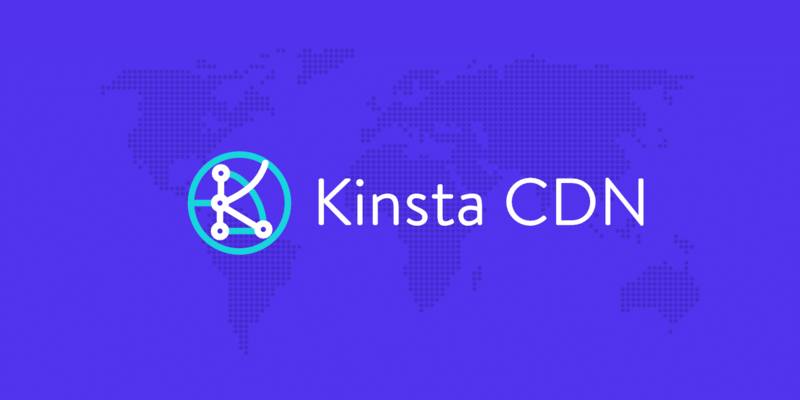 Here are some important notes regarding the Kinsta CDN integration. If you are already using Cloudflare or another third-party CDN, please don’t enable the Kinsta CDN, as it could break the appearance of your WordPress site. The Kinsta MU plugin must be installed for the CDN to deploy properly. The plugin is automatically installed on all sites that are installed from MyKinsta or migrated by our support team. If you have migrated over a site manually, please reach out to our support team and they’ll instruct you on how to install the Kinsta MU plugin. The Kinsta CDN is disabled on staging environments and cannot be enabled. All static content loaded by the CDN will be served over HTTPS. 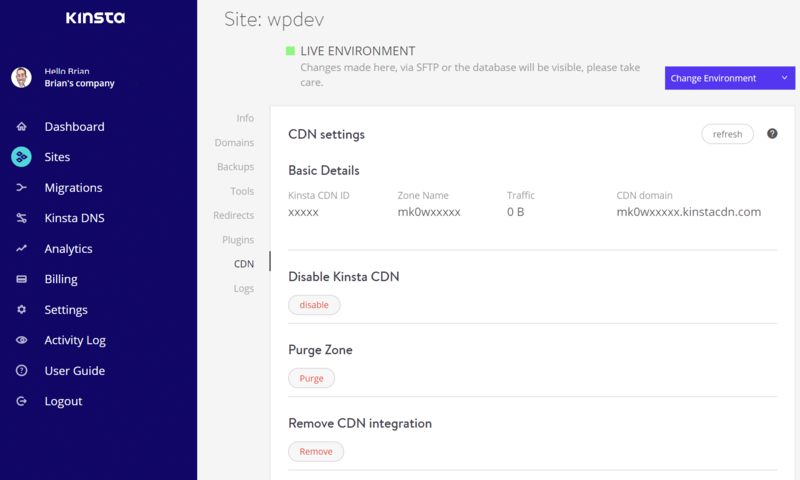 The Kinsta CDN will only serve static content from your wp-content and wp-includes folders. The Kinsta CDN will only cache assets that are smaller than 100 MB. If your site serves any assets larger than 100 MB we recommend using a suitable streaming or storage service, such as YouTube or Vimeo for videos, Soundcloud for audio files, and AWS S3 or Dropbox for large downloadable pdf files. Sub-directory and sub-domain subsites work with the Kinsta CDN. This includes domain mapping as well as mapping domains to a subsite. This has been tested with the WordPress MU Domain Mapping plugin and WPMUDEV’s Domain Mapping plugin. The current setup is only able to handle one CDN zone per install, and when the CDN is enabled it’s used on every subsite. So it’s not possible to disable the CDN on just one of your subsites. Some old subfolder multisites store the subsite’s assets in the blogs.dir, so it may not correctly host the uploads on the CDN. Multisites created with WordPress 3.5 or later will have the uploads in the uploads folder and will be loaded from the Kinsta CDN. For newer multisites there shouldn’t be an issue with uploads or conflicts between two subsites as images for example are kept within uploads/sites/site#/year/month/image.jpeg. Please keep in mind that each theme and plugin can add more complexity to the site, or do things in a different way so they may not work with the CDN as expected. If you have any questions regarding this, please reach out to our support team before enabling the Kinsta CDN. If you hit your CDN limit we’ll keep your site running and simply charge you $0.10 USD for each additional GB of CDN bandwidth. 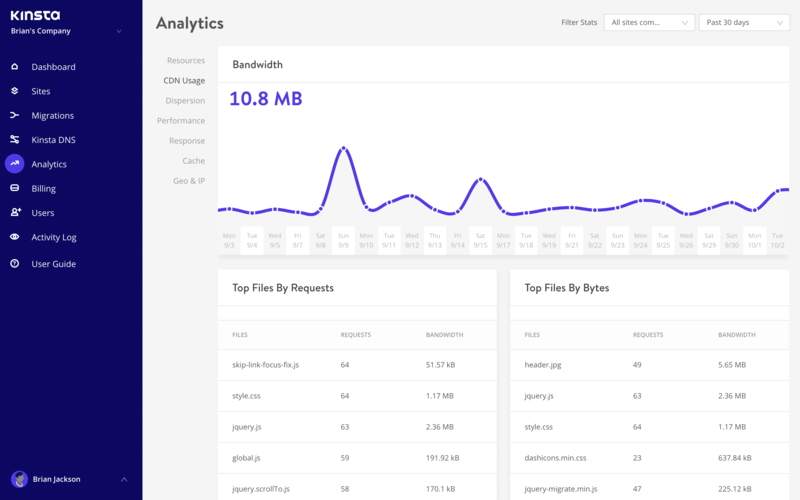 You can view your CDN bandwidth usage in MyKinsta Analytics under the CDN tab. 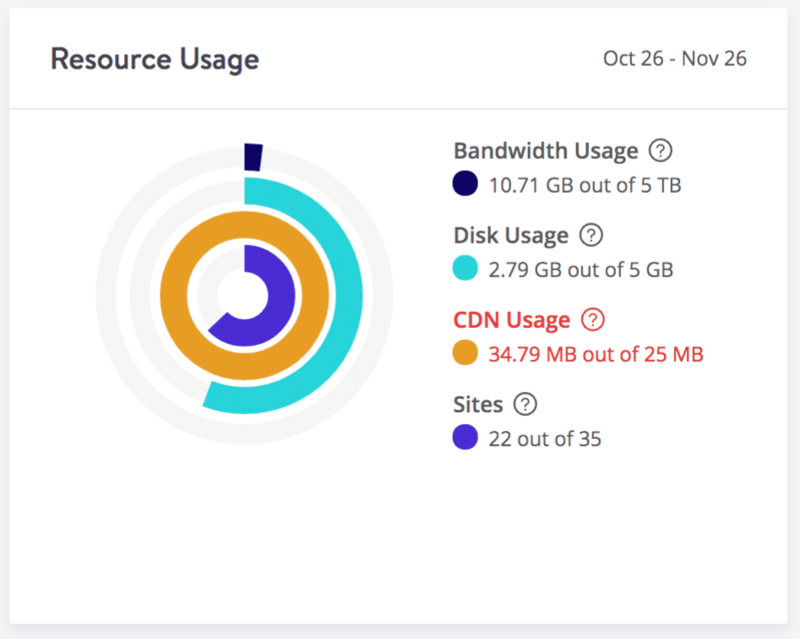 You can also monitor CDN overages in the Resource Usage widget on the main page of the MyKinsta dashboard. We redirect all traffic to HTTPS by default, but if you are running the Autoptimize WordPress plugin, ensure you are using HTTPS under the CDN base URL in the settings. If you enter HTTP by mistake it could result in mixed-content warnings on your site. Protocol-relative URLs should also work fine. Make sure to also purge the autoptimize cache after saving. When using the Kinsta CDN your images will most likely be crawled by Google directly from the CDN. 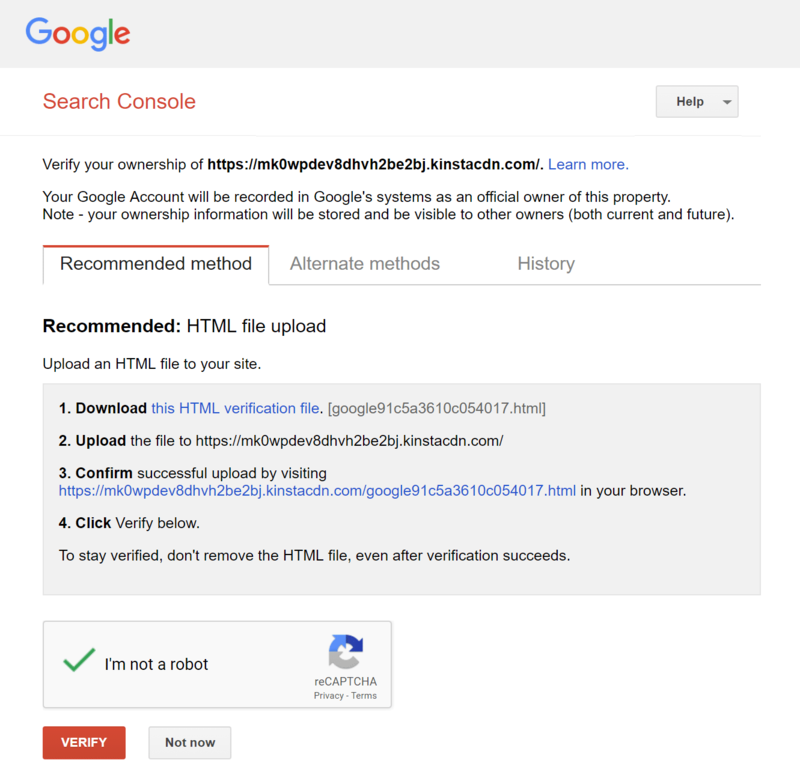 Therefore, if you want to see additional data about your images (such as if they are indexed), you might need to verify it with Google Search Console. Or you can add a special function to your WordPress site as outlined here to keep image data on your main domain. Because you don’t have control over the DNS for *.kinstacdn.com, you will need to choose the HTML file upload verification method. Download the file they provide and upload it to the root of your WordPress site via SFTP. Click on “Verify.” You should then see a successfully verified confirmation. → Do You Offer a CDN and/or Support Third Party Ones?